This Christmas, I decided to pare down our decorations. When I decided I didn’t need a Christmas tree, it triggered concerned inquiries from not one, but two, trusted friends! Let me assure you, that I am feeling fine! Admittedly, it has been a hectic fall, with the boys starting school and celebrating birthdays. We hosted Thanksgiving this year, so I did more than usual, making these painted and stenciled table runners. Yes, I normally go all-out and make my house look like a department store, but when it came to Christmas decorating this year, I had a simple, wintry look in mind. I started with this Christmas branch hung with ornaments. It was so quick, easy, and – if I may say so myself – pretty, that I really wasn’t missing the tree. 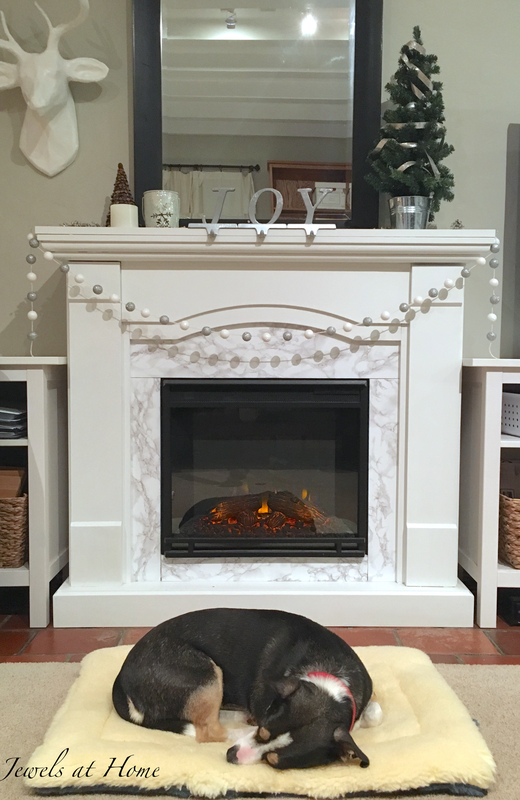 So, I continued with my simple decorations, including this garland for the family room mantel that I made from vase filler (similar vase filler) that I already had in the house. I used a large yarn needle to string the foam balls on twine and added a bit of glue to keep them in place. I told the boys that if one of them wanted a tree and could help me put it up, I would be happy to do it. After a few days, J did ask for the tree, so here it is. With these pretty lights, no other decorations needed. I think Finn the Dog agrees that this family room is a cozy place to relax on a winter day. So, no worries my friends. All is well over here. Just realizing that sometimes, going over-the-top is fun, and other times, a little bit of sparkle and joy is all you need. However you are celebrating this season, I hope you are feeling peaceful and bright!